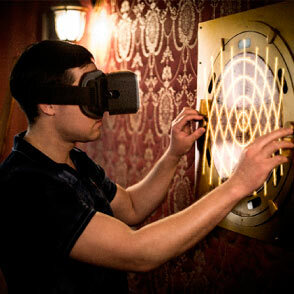 Escape Room in Virtual Reality. If you are a fan of the Escape Room don’t forget to try our Escape Room in Virtual Reality. Virtual Escape Room in Barcelona? In Virtua, we offer an amazing series of 2 to 4 person multiplayer escape room adventures for virtual reality! Gather your friends and choose a story to play! Fight against the clock to solve the puzzles and get out of the room as fast as possible or take your time to experience a unique story each time. We work with high-tech VR glasses (HTC-VIVE), with which you will be able to communicate with your team and enjoy the best experience that exists today in the world of Virtual reality. You can interact with objects to solve puzzles, work as a team and test your skills and ingenuity. That’s what awaits you behind the gates of our missions and mysteries. An absolute challenge, that to solve it you will need all your resolvent skills and also those of your friends. Join us for a Virtual Escape Room in Barcelona! Welcome to Animus Escape The Lost Pyramid is an escape game in Virtual Reality, taking place in the world of Assassin’s Creed Origins. In an old butcher’s shop in the UK. A really sweet old couple used to run this place, but recently they disappeared! Cold As Ice is another escape room adventure DLC for Tales of Escape, this time taking place in an old butcher’s shop in the UK. A really sweet old couple used to run this place, but recently they disappeared! You wake up to find yourselves locked inside the shop with no way out, your only option is to look around for clues to try and open the emergency exit, discovering the real story behind the disappearance on the way. Can you learn who locked you in here and escape before they come back?!? Trapped inside your own mind, inside your own dream!Test subjects of a secret organization that is feeding you hallucinogenic drugs, you are lost between reality and dream. After many attempts you manage to find an old corridor that descends into the depths of the mine, but a landslide trapped you inside. It is the night of Halloween and you find yourselves locked in a spooky graveyard after midnight. The place is decorated for the occasion, but awfully quiet, no one seems to be around, yet you can tell that you are not alone… You can feel the presence of a mysterious man, is he the one that locked you in here? And if so, what does he want? Can you figure it out before it’s too late? After attending a spectacular performance at the circus “De la Luna”, you find yourself trapped inside the clown’s quarters. After attending a spectacular performance at the circus “De la Luna”, you find yourself trapped inside the clown’s quarters. In a few minutes his show will end. Will you be able to find his spare key and escape before he returns? Everyone knows that clowns don’t like other people touching their stuff! One room, one door, one bloodied knife. What’s going on? What happened last night? You need to know. Are you sure you want to know? You have agreed to take part in an experiment relating to space time. One mistake has left you trapped in chaos. Choose and purchase our Virtual Escape Room in Barcelona voucher. You will find the bonuses in the Reservations tab of the menu bar of our website. Choose the bond that best suits your needs. Call us at 938 32 37 86, or send us an e-mail to info@virtuabarcelona.com, saying the date and time you want to come. Then we will proceed to make your reservation confirming the availability. We just need your presence. To live the VR come the day and time agreed, enjoy our Escape Room in Virtual reality. We hope it will be a unique experience!